“Gemunu” is a wild tusker was born in 1991, part of an elephant herd based in Yala national park of Sri Lanka. 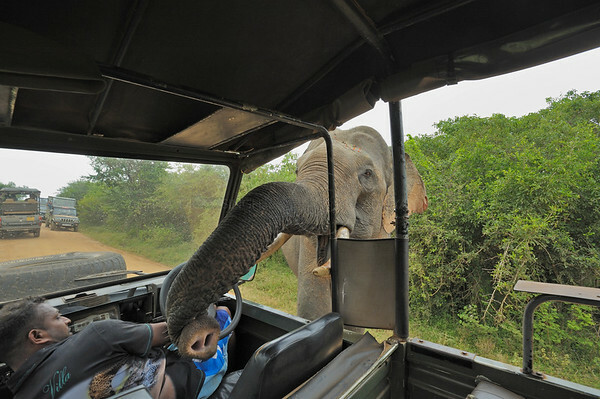 Though his mother was vary of vehicles and visitors to the park, Gemunu was extremely tolerant of them. Male elephants have to leave the herd once they grow up and after Gemunu left the herd he started spending most of his time in zone 1 of Yala national park. Soon enough he got used to spending a lot of time in a resort at the edge of the park and in Sithulpawuwa temple, where he was fed by the monks. During his time spent near the temple he realized that the cars parked there usually have some food, which he started picking. About a year ago he started raiding tourist cars inside the national park for food and has now made it a regular habit. In my recent visit to Yala we saw a tusker foraging in the forest jus of the main track of the national park. Soon enough a number of vehicles converged at that point and our vehicle got blocked off by other vehicles. 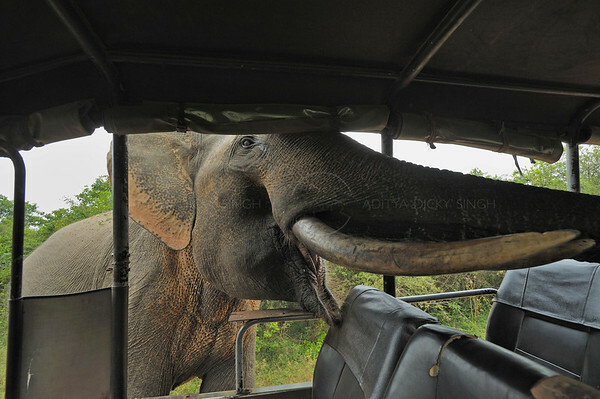 That is when my friend and Sri Lankan naturalist Mevan Piyasena told me about Gemunu’s “friendly” raids on cars. By that time he was almost upon us. He first pushed the driver of our car off his seat and then poked his head inside the car looking for food. 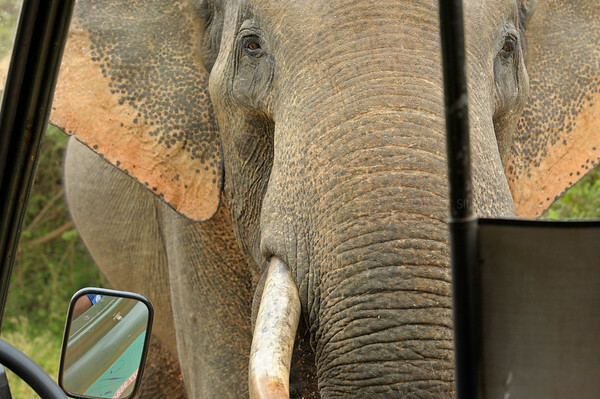 He checked each one of us with his trunk and then poked his trunk all around our Landcruiser looking for food, that we did not have. All that I could think of was to stay calm, keep away from his big tusks and keep the camera steady. After what seemed like hours, though it was just a few minutes, he moved on to the next car. We got out of there as fast as we could. Is this an accident waiting to happen? I think so. Check the pictures out.